Day has broken on the coast of Cayo Guillermo, a small island paradise off mainland Cuba, connected only by a single man-made causeway and a divinely-made crystal clear ocean. Here we have come for a week of renewal, rejuvenation, and of course, adventure. On this morning, myself and my husband, David; his father, Michael; our daughter, Zae; and our friends Josh, Talia and Anthony, are heading out for a day of deep-sea fishing. With high hopes of stringing out a few fishermen’s tales of our own, we embark aboard a sturdy fishing vessel and set sail. Skippered by El Duro (“the tough one”), our trip has barely begun when we are offered the option of a freshly caught lobster lunch. After a resounding ‘yes’ by all, El Duro dives down to a set of strategically sunken car tires that are covered by wooden boards. Lobsters hide in these rubber shanties because there are few places of shelter in the otherwise open ocean floor. Without hesitation David dives in after him. A few minutes later, El Duro surfaces with a large lobster, and shortly after David pops up too, victorious with a lobster in each bare hand—one as big as El Duro’s, and the other bigger than any fisherman ever dare lie about. Our lobster catchers reboard, and we drop our bait lines and speed to deeper waters. And then they appear—as if not to be outdone by a pod of arthropods, the barracudas make a fast and furious debut. 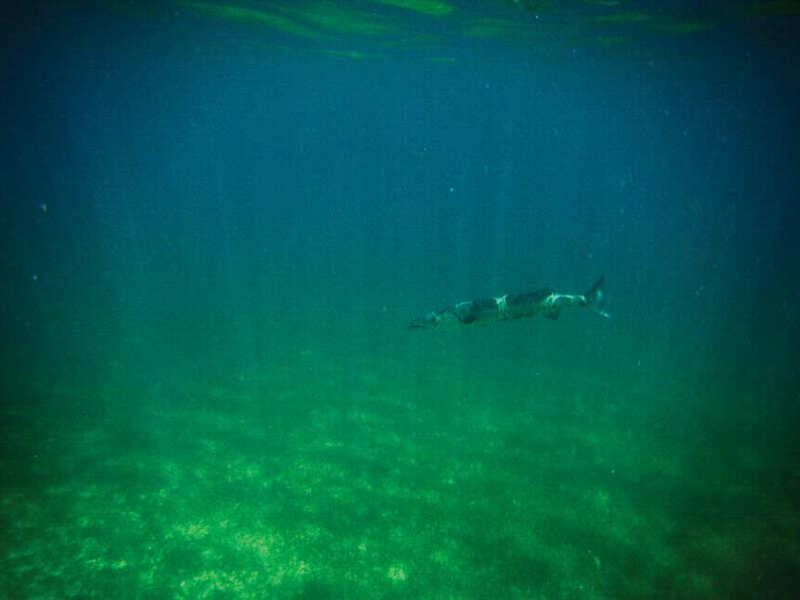 Living primarily in oceans, barracudas are commonly found in Cuba, and though there are 26 species of the fish worldwide, many have the classic silver/grey top with white underbelly. Extremely opportunistic predators, they are built like sleek torpedoes with steel trap jaws, and rely on their excellent vision, short bursts of speed (they can go over 40 kilometres an hour), and the element of surprise to catch smaller fish. Although barracudas sport unfavourable reputations, the reality is that unprovoked attacks on humans are rare, and are often attributed to cases of mistaken identity where people have been confused for prey. And yet these highly adaptive predators find themselves falling prey to us—in no time at all we reeled in three, each larger than the last. 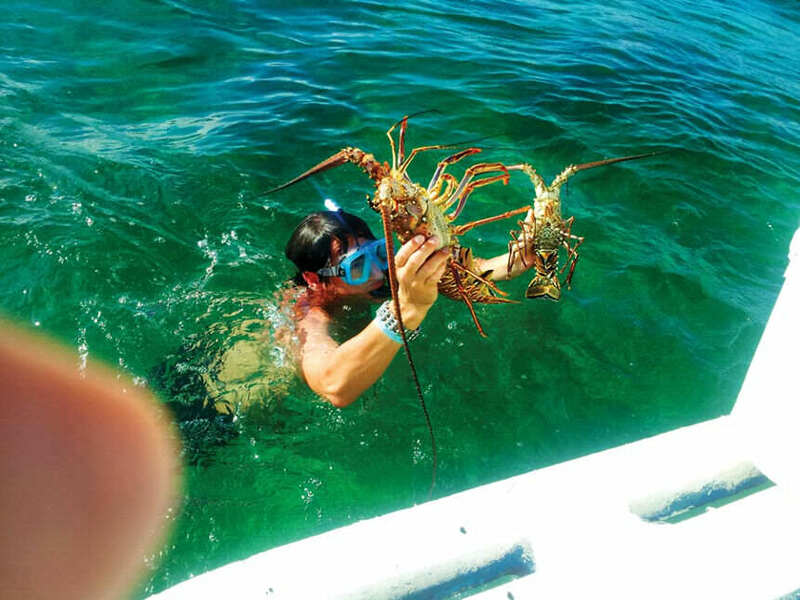 A contagious excitement fills our boat when we do, and we snap pictures of our champion haul of fit-for-king lobsters and ferocious fishes. We fish most of the morning, before El Duro takes us to a coral reef where we will snorkel and he will prepare our lobster lunch. With about 3,735 kilometres of coastline, Cuba is a haven for underwater adventurers, attracting divers and snorkellers from across the globe. 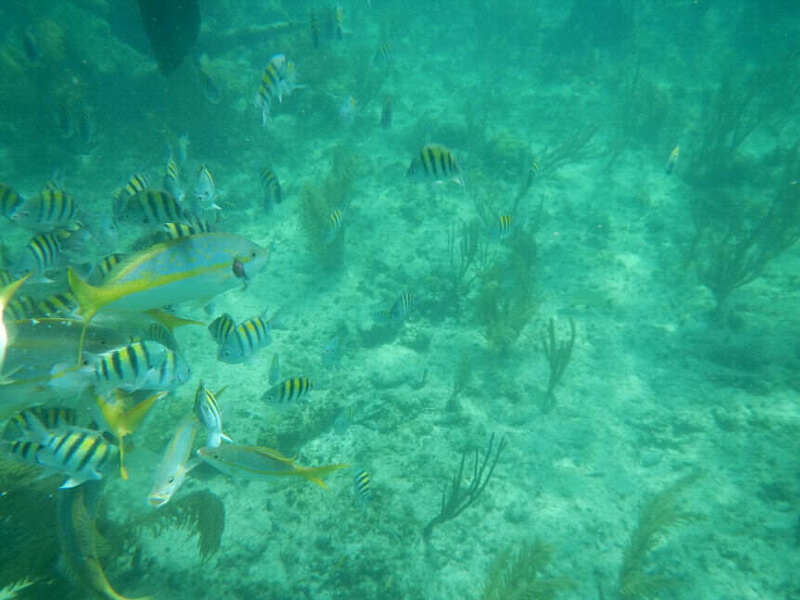 Jardines del Rey specifically treasures more than 30 pristine dive sites, which along a 32-kilometre coastal stretch just north of Cayo Guillermo are host to a stunning array of subaqueous flora and fauna. Once we set anchor, David, Anthony and I opt to dive in with our snorkels, but only after El Duro’s express assurances that we would not find barracudas gliding silently and otherwise undetectedly in this particular stretch of reef. Schools of colourful fish mill beneath us, conducting whatever non-urgent business fishes attend to throughout the day. I know David, our relentless photographer who is armed with an underwater camera, quite intuitively—he would totally scream that just to get a shot of our reaction. He’s taught me a few good lessons over time, and one is to never trust a photographer. He appears adamant however, and I eventually follow his gaze just in time to see a shadow, unnerving in size and increasing in threat, emerge from the murk. The outline (literally half the size of me) slowly fills in, and I see a silver, clenched, jagged, piranha-like maw and wide unmerciful eyes. It looks exactly as the frightful but helpless fish that hung from my hook not an hour ago did—only now we are in its environment and the ones on the metaphorical hook. 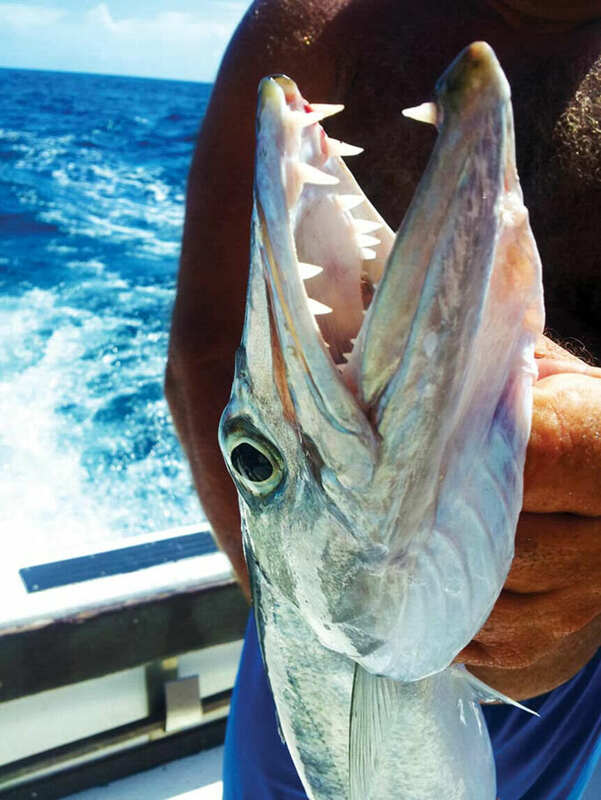 Having never before encountered a barracuda but been plenty warned in the event of it, I assume that like many wild creatures it would adhere unerringly to one of its two major forms of existence: hungry and not hungry. Unfortunately, with no convenient neon sign flashing which state it was currently experiencing, our existence feels as if it’s suddenly being defined by three distinct options: prepare to be bitten, pray you won’t be, pray harder it’s alone. The only thing more frightening than stumbling upon a barracuda is stumbling upon a battery of them, because while adult barracudas prefer a solitary hunt, younger ones tend to hang out in schools. And now, as it comes fully formed out of the shadow and we find ourselves face to face—as I am staring him straight in the eye—I don’t know if he’s hungry, full, swimming solo or packing a posse. The only thing I am certain of is that I’m the smallest of the three of us, and if anyone is to be confused for prey it will likely be me. David, Anthony and I cluster together, eyeing the predator as it slowly encircles us. Diving directly beneath us, it suddenly seems to see me for the first time and begins to swim toward me. I immediately fear he may be deciding whether I’d make a tasty afternoon repast, when I notice the sun glinting off the ring on my finger. To my dismay, I realize I’ve just given him every reason to believe I am, indeed, an option. Because of its plausible likeness to the reflection of fish scales, causing you to seem “fishy” to potential predators, wearing shiny jewellery while snorkelling is a no-no. Should you prefer to not heed this, please remember that a diamond is forever only if it doesn’t get eaten by a barracuda. Anthony, witnessing what looks like a purposeful advance, quickly puts himself between me and the contemplating carnivore. As self-sufficient as I normally like to be, I’m grateful for the chivalry. The idea of losing a few fingers to a misguided fish, while my horrified daughter looks on, simply because my ring surrendered me to the likeness of a yellowtail snapper, is not exactly how I envisioned this trip ending. “I’m impressed, you totally kept your cool!” Anthony says to me as we surface. “Well, for all you know, I peed myself,” I reply. Exhilarated as we are relieved, Anthony hops aboard the boat to adjust his snorkel while I stay in the water to wait for David. I notice then that the fair visibility at this depth only extends a few metres before it completely obscures anything beyond that. And I suddenly grasp that we would never see a shark coming until it was too late. Considering the schools of fish that had remained in the area after the barracuda made its appearance, it seemed to me their perception of a flashing neon warning sign must be more innate or intuitive. I figured as long as the little fishes were sticking around I likely had little to worry about. I had barely finished the thought when suddenly my fish-danger meter scattered beneath me, fleeing some commotion behind us. Wheeling around in panic, my heart raced as I saw Anthony recovering from what looked like a sloppy dive back in the water. David thankfully returns unscathed, and we hop aboard for a feast of lobster so fresh that I almost slapped it. It is the best we’ve ever had, and with bellies full we sit back, drink beer and excitedly recap our adventure. Zae, however, refused to eat the lobster, claiming we are disgusting after having watched it get gutted and cleaned, and maybe she was right. 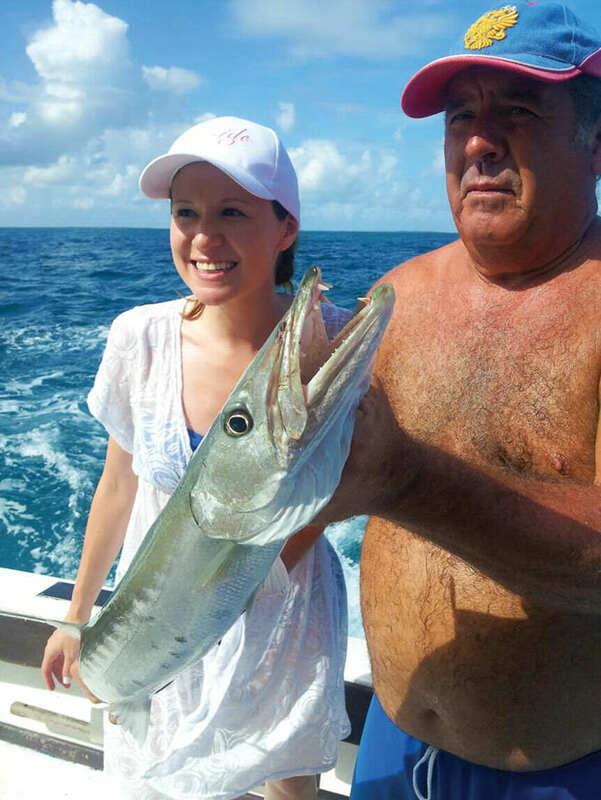 No better than a merciless barracuda, we had stalked innocent prey and killed it for food. But after feeling as if I was almost served up myself today to another of the sea’s creatures, I have to admit I was supremely satisfied to reclaim my spot at the top of the food chain. “What, him? Nah! He doesn’t bite,” he replies. El Duro, are you by any chance a photographer?